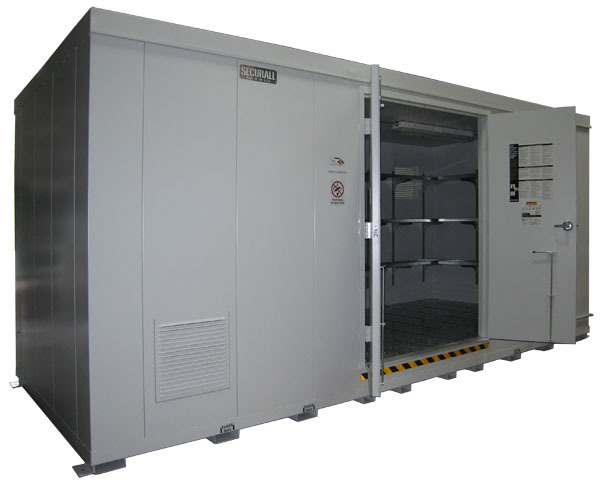 Securall offers a complete line of safety storage buildings specifically designed for storing agri-chemicals and equipment safely. All buildings are designed to help you comply with safety rules when mixing and handling pesticides. 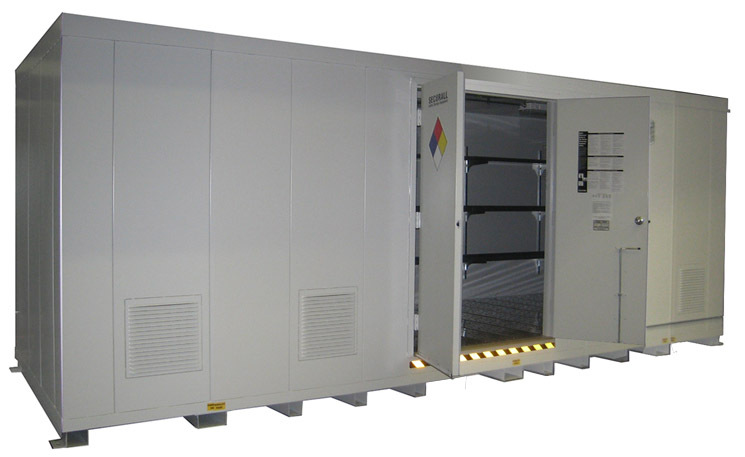 These specially designed buildings are perfect for Golf Courses, Farms, Nurseries, Greenhouses and Landscape Contractors. 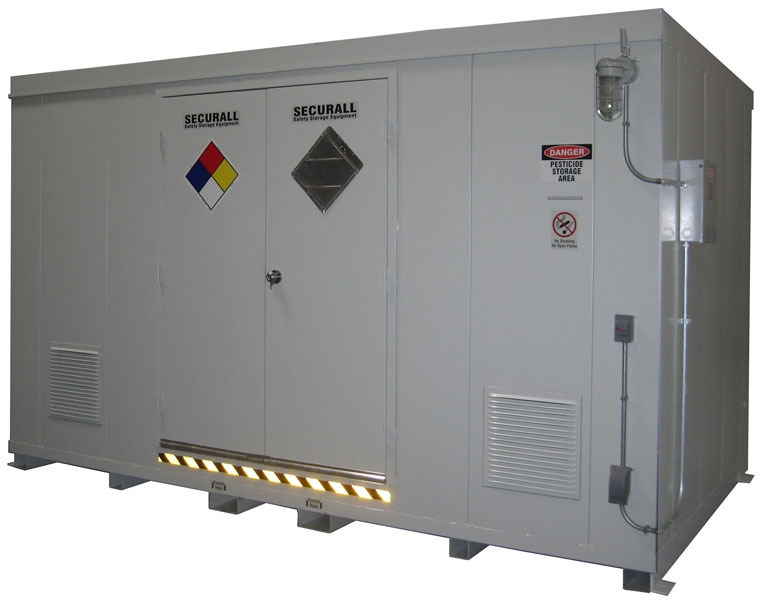 Securall buildings help reduce the risk of poisoning and injuries among pesticide handlers and agricultural employees and will also help you protect against chemical spills, children and animal poisonings, theft, fire and unauthorized personnel. 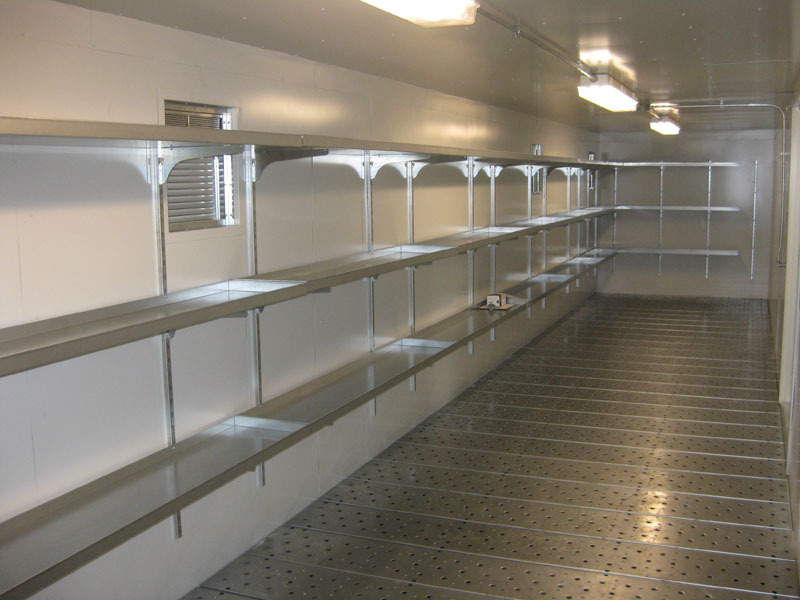 Shelving & Lighting - Chemical Storage lockers/buildings comes with 3 tiers of shelving. Interior & Exterior lighting, a receptacle and load center. 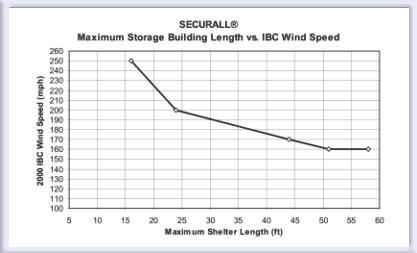 Easy To Ship Securall's Chemical Storage Buildings (AG1200 and Below) are designed to fit in a standard high cube shipping container reducing shipping costs and labor time. Hazardous Chemical Storage Reporting Requirements - Hazardous chemicals are any substances for which a facility must maintain a Material Safety Data Sheet (MSDS) under the OSHA Hazard Communication Standard, which lists the criteria used to identify a hazardous chemical. MSDSs are detailed information sheets that provide data on health hazards and physical hazards of chemicals along with associated protective measures. Hazardous chemical used or stored in the workplace, facilities must maintain a material safety data sheet (MSDS), and submit the MSDSs (or a list of the chemicals) to their State Emergency Response Commission (SERC), Local Emergency Planning Committee (LEPC) and local fire department. 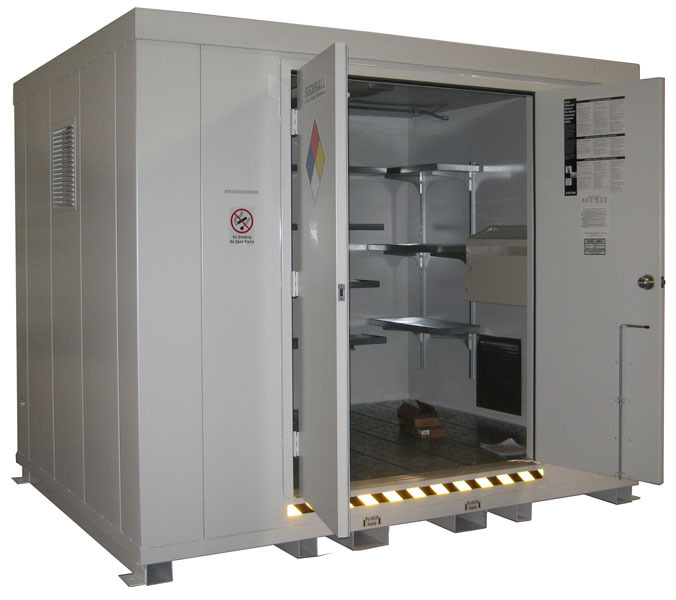 Any facility required under Occuptational Safety and Health Administration (OSHA) regulations to maintain material safety data sheets (MSDSs) for hazardous chemicals stored or used in the work place. Do not store liquid chemicals and dry chemicals together regardless of which compatibility group they fall into. Do not store chemicals from different compatibility groups together. Water treatment chemicals are divided into six incompatible groups: Acids, Bases, Salts & Polymers, Adsorption Powders, Oxidizing Powders, and Compressed Gasses. To ensure the safety of system personnel and the system itself, store each of these groups of incompatible chemicals separately. Warning - Do not store products such as paint, antifreeze, detergent, oil, grease, fuel, solvent, and beverages in the same area as water treatment chemicals. Calcium Hypochlorite, a combination base/oxidizer should not be exposed to moisture or mixed with viscous fluid such as oil - Excessive heat, fire or explosion possible. Can provide an ignition source for combustible materials. Warning - Concentrated Sulfuric Acid, a strong acid, should not be mixed with Concentrated Sodium Hydroxide, a strong base - Excessive heat and liquid explosion. Note: Highly concentrated acids and bases when mixed together will have a much more hazardous reaction than weak acids and bases. Common Water Treatment Chemicals - Sodium Hypochlorite, Calcium Hypochlorite, Calcium Hydroxide, Calcium Oxide, Sodium Bicarbonate, Sodium Carbonate, Chlorine, Sulfur Dioxide, Potassium Permanganate. AG200 - 68.4 Cubic Feet Chemical Storage Locker; Sump Capacity 55 Gal. ; Exterior Dimension 6'11"H x 5'W x 3'6"D; Approx. Ship. Wt. 1,431 Lbs. OPFR2-200 - 2 Hour Fire Rating Upgrade ; Approx. Ship. Wt. 1,298 Lbs. OPFR4-200 - 4 Hour Fire Rating Upgrade ; Approx. Ship. Wt. 1,722 Lbs. AG400 - 145.1 Cubic Feet Chemical Storage; Sump Capacity 68 Gal. ; Exterior Dimension 6'11"H x 5'W x 5'D; Approx. Ship. Wt. 1,898 Lbs. OPFR2-400 - 2 Hour Fire Rating Upgrade; Approx. Ship. Wt. 1,363 Lbs. OPFR4-400 - 4 Hour Fire Rating Upgrade ; Approx. Ship. Wt. 1,878 Lbs. AG600 - 211.4 Cubic Feet Chemical Storage; Sump Capacity 102 Gal. ; Exterior Dimension 8'4"H x 7'W x 5'D; Approx. Ship. Wt. 2,236 Lbs. OPFR2-600 - 2 Hour Fire Rating Upgrade ; Approx. Ship. Wt. 2,239 Lbs. OPFR4-600 - 4 Hour Fire Rating Upgrade ; Approx. Ship. Wt. 2,973 Lbs. AG900 - 308.1 Cubic Feet Chemical Storage; Sump Capacity 154 Gal. ; Exterior Dimension 8'4"H x 7'W x 7'D; Approx. Ship. Wt. 2,742 Lbs. OPFR2-900 - 2 Hour Fire Rating Upgrade ; Approx. Ship. Wt. 2,712 Lbs. OPFR4-900 - 4 Hour Fire Rating Upgrade ; Approx. Ship. Wt. 3,604 Lbs. AG1200 - 404.7 Cubic Feet Chemical Storage; Sump Capacity 206 Gal. ; Exterior Dimension 8'4"H x 7'W x 9'D; Approx. Ship. Wt. 3,375 Lbs. OPFR2-1200 - 2 Hour Fire Rating Upgrade ; Approx. Ship. Wt. 3,059 Lbs. OPFR4-1200 - 4 Hour Fire Rating Upgrade ; Approx. Ship. Wt. 4,108 Lbs. AG1600 - 524.1 Cubic Feet Chemical Storage; Sump Capacity 272 Gal. ; Exterior Dimension 8'4" H x 10' W x 8' D; Approx. Ship. Wt. 5,226 Lbs. AG2400 - 747.7 Cubic Feet Chemical Storage; Sump Capacity 393 Gal. ; Exterior Dimension 8'4"H x 14'W x 8'D; Approx. Ship. Wt. 6,443 Lbs. AG3200 - 971.3 Cubic Feet Chemcial Storage; Sump Capacity 514 Gal. ; Exterior Dimension 8'4"H x 18'W x 8'D; Approx. Ship. Wt. 8,030 Lbs. AG3800 - 1,277.3 Cubic Feet Chemical Storage; Sump Capacity 636 Gal. ; Exterior Dimension 8'4"H x 22'W x 8'D; Approx. Ship. Wt. 9,520 Lbs. AG4800 - 1,418.5 Cubic Feet Chemical Storage; Sump Capacity 757 Gal. ; Exterior Dimension 8'4"H x 26'W x 8'D; Approx. Ship. Wt. 10,566 Lbs. AG6400 - 1,865.7 Cubic Feet Chemical Storage; Sump Capacity 1,000 Gal. ; Exterior Dimension 8'4"H x 34'W x 8'D; Approx. Ship. Wt. 13,584 Lbs. 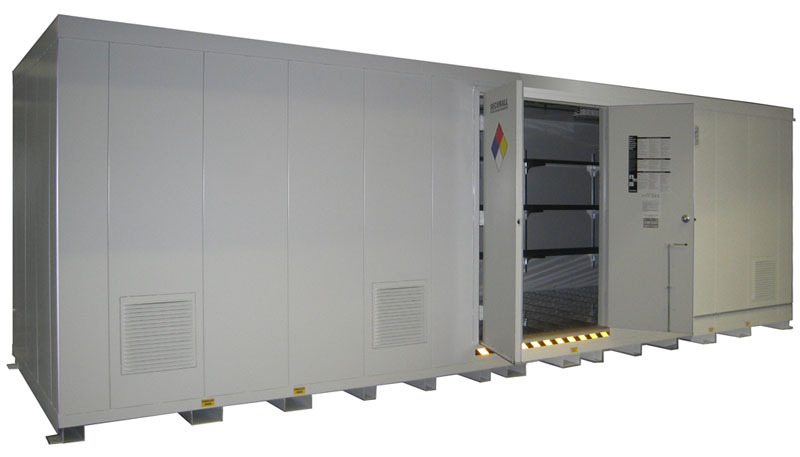 AG8000 - 2,313 Cubic Feet Chemical Storage; Sump Capacity 1,234 Gal. ; Exterior Dimension 8'4"H x 42'W x 8'D ; Approx. Ship. Wt. 15,301 Lbs.